As much of the current parks public annonéens, the park Mignot and resulting from a private park of which good number were created at the 19th century or the beginning of 20th. More or less modified in the course of time, it still is very marked by its origin. This public park acquired by the city in 1943, of a surface of almost 7000 m2, has a structure in stages and preserved its orangery whose house emerges on its higher part. This part is equipped with one garden to the Frenchwoman with two large parts of water and a staircase with double revolution, whereas in contrebas one can discover an installation with English. The origin of this park called also Levert, goes up with its acquisition in 1793 whereas it was yet only one immense holding of vines. 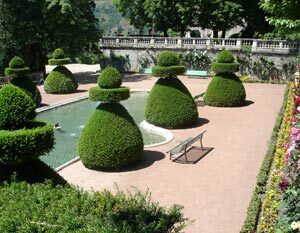 It is the nursery gardener Jean-baptiste Jacquemet-Bonnefont who arranged this splendid property in terraces. This rock headland, placed at the top of a river, offers to the sight the hills and a valley planted of innumerable blue cedars.